Exclusive Lance's Left Surf Resort - Sipura Island, Mentawai, Sumatra Guests overall rating: ☆☆☆☆☆ 0 based on 0 reviews. 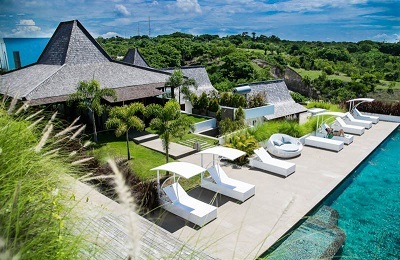 The Lance’s Left Surf Resort is located 150km away from Sumatra, Indonesia, on Sipura Island. The resort has three bungalows that can host up to 10 guests in total. The landscape and distance from each bungalow makes this place ideal for anyone who wants to disconnect from crowds, as our guests enjoy a private and comfortable experience in and out the water. Each bungalow is equipped with a double bed plus a single bed, a private bathroom, a fully furnished living room area and a balcony with chairs and hammocks. They are situated right in front of an expansive bay where Lance’s Left breaks. You can even check the waves without leaving your bedroom. 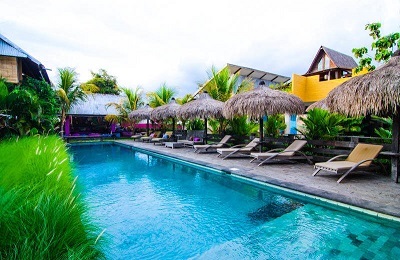 Surfers and non-surfers alike will enjoy their stay with us, with various fun activities available, such as snorkeling, fishing, lounging, trekking the beaches and trails, biking the island, visiting the Kulu Kubuk waterfalls, and experiencing unique cultural tours in the nearby villages. The bungalows are located right on Lance’s Left beach, so you can literally check the waves directly from the hammock on the terrace. Our accommodation has a traditional Mentawai design and feel, but has all the modern comforts and amenities. All bedrooms have air conditioners and fans, so you can regulate the temperature to your taste at all times. The bungalows have European electrical outlets to plug in all the devices you may need (220 V), plus an iPod docking station to relax to your favorite tracks. Every bungalow is equipped with a double and a single bed, each one with a mosquito net, a fully furnished living room area inside the bungalow, a mini-fridge, kettle, tea and coffee, and a private fully tiled bathroom with sink, toilet, mirror, shower, shampoo, and soap. And before every trip, you’ll be given a bath towel. There is also a big, spacious balcony with very comfortable chairs and hammocks to enjoy the breathtaking views of the beach and Lance’s Left. Your stay includes three big, delicious meals every day, cooked by our outstanding chefs, plus healthy and varied snacks on all the surf trips. There’s also room service and a restaurant for food, drinks (beer, no hard liquors), and snacks. We know how important is to stay connected, so our digital area and lounge have free high-speed satellite Internet , 24/7 Wi-Fi, as well as a big-screen projector, a DVD player, a sound station and a pool table. In the shared bungalows, there are common areas (such as the living room and the balcony) with relaxing hammocks in which to sit back and observe the ocean and waves. The Mentawais offer many good surf spots, with great breaks just in front of your room. You have easy access to Lance’s Left, and nearby there are 10 other waves barely 10 minutes away by boat. There is consistent swell and surf for everyone, with water temperatures around 27°C all year round. The best time to surf here is between April and October. Even during the offseason, when the trade winds switch directions, there are still classic waves to be ridden, and the swells remain regular. Wake up and watch the sets right outside of your window, then go for breakfast at the restaurant and enjoy the fresh food. Chill in hammocks or lounge while you decide where to surf, then have a snack and fish in between sessions. After you are finished surfing, enjoy lunch at the resort, relax at the restaurant or your bungalow, and do one of the activities or tours. Then hit the waves again, before heading home to relax and enjoy dinner and a beer. Things to do close by include fishing, snorkeling, trekking and biking, yoga and Thai massage, woodcarving, pool games, lounging, visiting local villages, participating in unique cultural tours, surfing the web with high-speed satellite Internet, listening to music, and watching DVDs or surf videos on the big-screen projector. This Mentawai resort is located on an idyllic tropical bay right by the beach, so you can lie in your hammock and watch the waves at Lance’s Left, one of the best breaks around. You can walk or ride to the nearby villages, use the motorbikes to explore, and even go for a trek along the island’s coast. Arriving at this uncrowded island may take a bit of effort, but don’t let that dissuade you from coming to paradise. It’s completely worth it! If you need any assistance, just let us know. Here is a short outline of how to get here. Kuala Lumpur in Malaysia, with one or two flights per day with AirAsia. 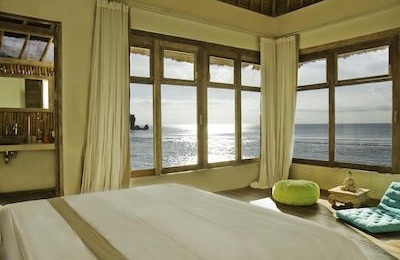 The resort offers guests a return transfer to and from the airport in Padang, Sumatra. After your arrival in Padang, we will pick you up at the airport at any time and shuttle you to the Mentawai-bound ferry (or a hotel in Padang if you have to spend the night before the ferry ride). The return boat transfer service from Padang-Resort-Padang costs $350 USD. The ferry takes you to Sioban or Tua Pajet. From there, the resort boat will pick you up to complete the rest of your journey. If you plan to take the ferry, you’ll need to arrive in Padang the night before the day of the ferry departure. We can arrange a hotel for you to stay in Padang for the night if necessary. The second option is a private speedboat to the resort. This is a nice alternative for groups of 3 to 10, directly from Padang to the resort. This is the fastest travel option, and can be arranged to suit any flight schedules to and from Padang. This boat trip may be rescheduled due to extreme weather conditions. The cost to charter a speedboat is USD $ 2,000.00 for the entire boat, one-way. Please contact us for availability and more information. Hotel in Padang if required (US$25 to US$90). The new SURFER TAX from the government is one million rupiah per person for 15 days (roughly 75 USD).